Ivanka Trump: A 34-year-old "technology analyst" named Sara Schmidt has undergone a comprehensive plastic surgery procedure to maker herself look like Ivanka Trump. In a video, she says "I think she is beautiful. I think she's very poised, classy. I like the way she carries herself. What's not to like?" I guess that's true enough. Emulating someone you like certainly isn't a crime, but a quick google of "celebrity lookalike plastic surgery" reveals returns rather depressing results. 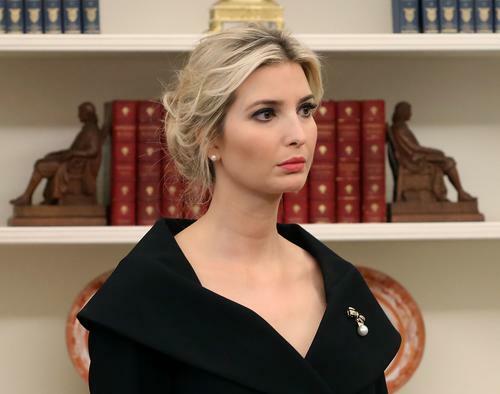 Schmidt isolates her chin and her "belly" as areas that she wants to change the most (along with the swoop of the Trump daughter's bum). The night before the procedure she invites some of her good-looking young friends over for a last supper and they toast to "the new me." After the surgery, she has a reveal ceremony at a restaurant where, for some reason, she gets an introduction from a former Bachelor contestant. At the ceremony, Schmidt says "I absolutely have the Ivanka look I wanted."